To compete with the all-new Hemi engine in 1964, Ford secretly developed an overhead cam version of the high performance FE block, the legendary 427 SOHC. This engine has become known as the Cammer. 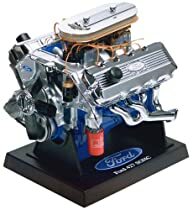 1:6 scale model of the Ford 427 SOHC engine. This model does not have internal components (pistons, valves, etc. ).